I have to admit that I'm actually a sucker for small eateries. Numerous times I found out that there are a lot of places with pretty good food in those types of establishments, just waiting to be noticed (since they're not nearly as big as say... KFC). One such places was this QD Cafe.. which me and my partner discovered coincidently. My partner was waiting for his blender (yes, a blender) to be fixed next door so we decided to try out the relatively quiet eatery. 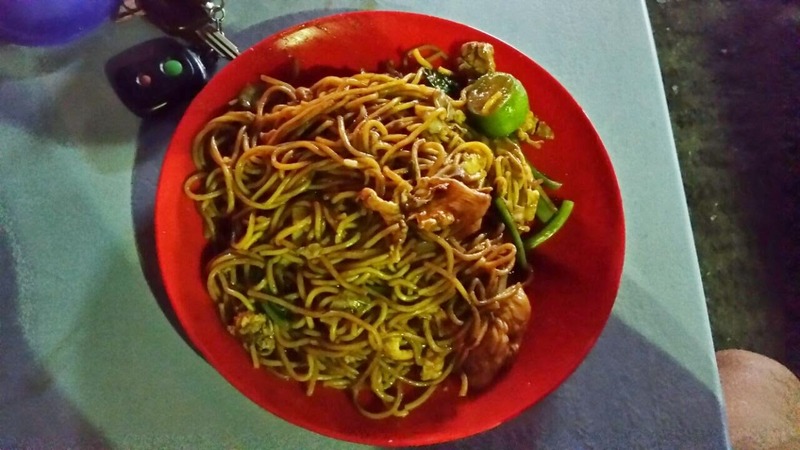 If you're wondering where the heck is the place... it is actually situated at Jalan Chen Fook at Sabindo's main town area, specifically at the row of shops in front of an in-famous local Chinese seafood stall called Kam Ling Seafoood (more on that later). Now what attracted us to actually step into the cafe ourselves were the very enticing looking pictures of their available menus being prominently displayed all around the cafe's walls. And I do appreciate the fact that most of their menu pictures (which consist of popular local dishes and Western treats) were actually pictures taken by them (as oppose to just downloading unrealistic looking pictures from the internet). Also another plus for them was the fact that they do have a ready-stock for all of their food even though there were very limited patrons around. We were very drawn to their Nasi Goreng 1Malaysia (my partner gave his thumbs up), Nasi Goreng Lalap (very tasty and spicy sambal, I loved it) as well as their version of Cheesy Wedges (rather small in portion but still very delicious). 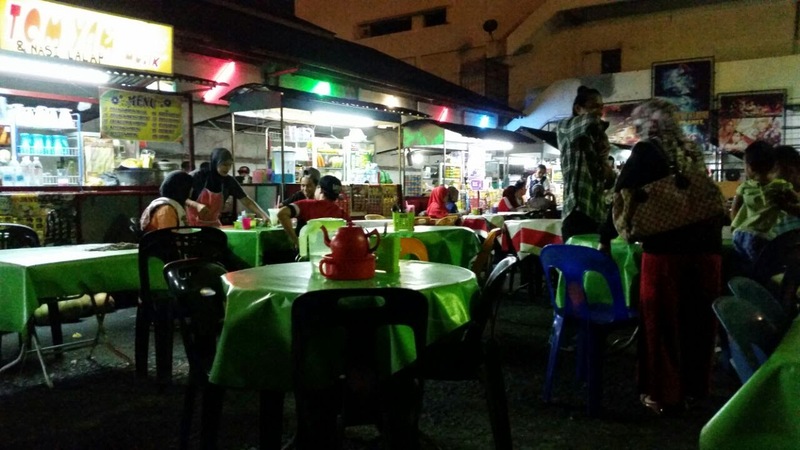 So I did mention before in my previous post that there are around 3 major nightly food stalls in Tawau, Sabah and another one of those is this place. If you do visit the place, you'll see that the place will be jammed packed with people during the weekends as well as the Ramadhan fasting month. And obviously from the title above, the food stalls are situated right beside the very nostalgic Empire Building (said to be as old as my grandparents, or more) and in close proximity to Tawau's police headquarters in town. Personally I prefer this place (as oppose to the previous one that I've reviewed) as it is brighter and cleaner looking but food-wise, they might be lacking in variety. Food stalls generally had very similar menus to one another so the competition were very stiff here. If you're a keen observer (ehem!) than you'll notice that some of the stalls are more popular than others so logic says that those places might be better in terms of taste than their rivals. So to test that theory, me and my partner (who'd frequent this place these few years) decided to try a stall with lesser customers this time around. We decided upon their Nasi Goreng Aspar (similar to that of Nasi Goreng Lalap but with more side dishes - which was not bad in taste but I admit that there are better ones nearby) and their Mee Goreng Ayam (my partner does not like it though, he said that it tasted weird and a bit hard to chew). So I guess we can conclude that yes, there might be some truth to the deliciousness (wow, even I'm impressed with myself for finally being able to use that word - har har har) of the popular stalls. 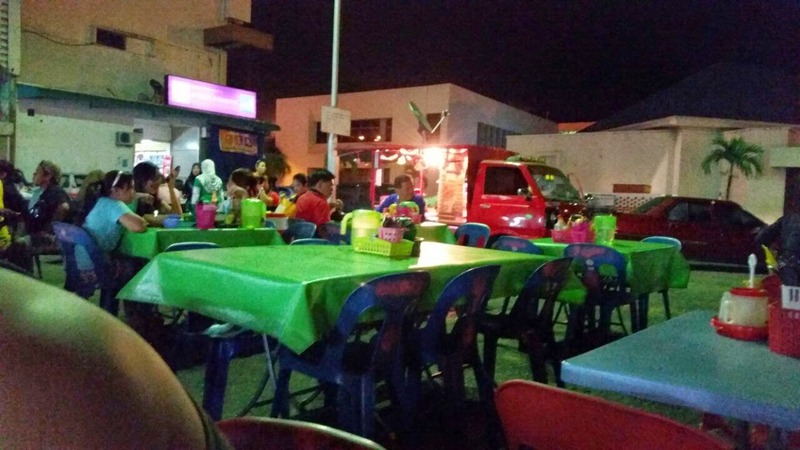 Other than those heavy duty food, there're also a burger food truck (courtesy of Tawau's very own Nang Burger - man, those food trucks are everywhere!) and a single grilled chicken wings stall within the area for you to try. In my years of blogging (that sounds longer than it actually is), this is the first time that I did not know the exact name of the stall that I'm going to review. And the even sadder thing? I'm actually a frequent patron of said stall. Oh well, I'm just going to put down Sate Cocos Fujimart for now because of several reasons. Well, it's not actually that hard to guess them; its mainly because the place sells sate (satays), the family behind the stall are Cocos in ethnicity and of course lastly, it's situated beside the long abandoned Fujimart building in Tawau. Yes, it's official people.. I'm a genius! (maybe in my dreams...). 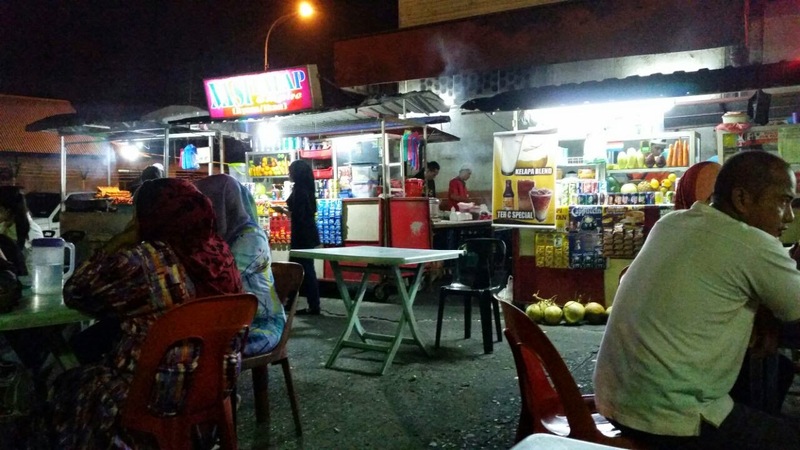 Even though there are several other branch stalls within the Tawau area that're opened by the said family (including the popular Mas AF Satay stall - as it is said that they're all related), this one is one of the more popular hang-out for Tawaurians. So obviously from the name, their official main dish has got to be their satay. Since I've been to this establishment for quite some time, I can probably say that their satay and its once famous peanut sauce has gone somewhat of a 'downgrade' over the years. The satay were delicious as ever, but the size has been reduced significantly. 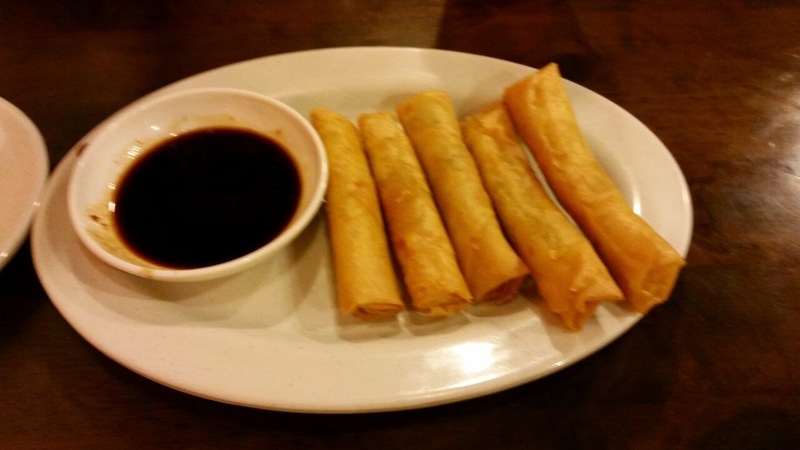 The peanut sauce was also not as thick with peanut as it used to be. But one can hardly blame them for trying to survive the current economy right (fancy me an economist.. huhuhu...). They also sell pretty good Sayap Ayam Bakar (grilled chicken wings) as well as the very well-known Gogos (a local version of the 'pulut'). They'd also branched out in their menu and are now selling burgers as well. Since I was waiting for my partner to finished up his banking business nearby, I thought I grab something to eat first. Mind you, I've always heard of this place (located at Ba Zhong Commercial Centre, directly facing the main round-a-bout) from numerous people before so this is the perfect opportunity to try them out. 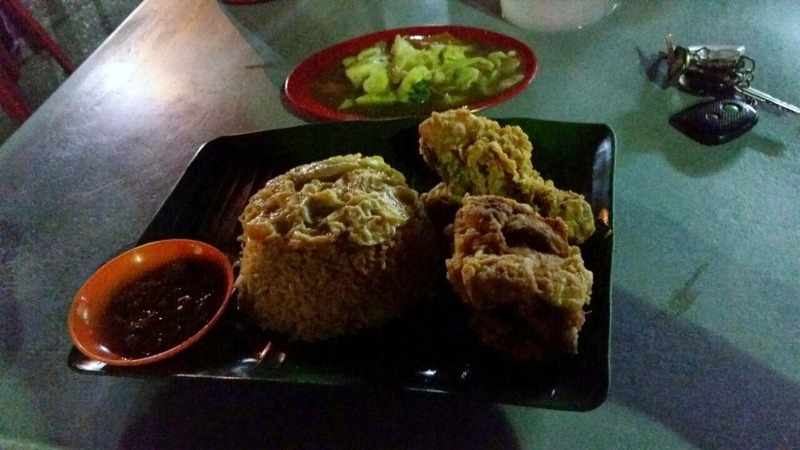 I've ordered their Nasi Goreng Ayam Penyet which was actually very delicious. But I got a bit annoyed when the waiter got my order (yup, my single order) wrong not once but 3 times (it's an 'evolution' from Nasi Goreng Biasa to Nasi Goreng Ayam and lastly Nasi Goreng Ayam Lalap before they finally got it correct - true story folks). Man, I do feel sorry for their obviously very confused and probably pissed-off cook. And there wasn't even anybody around at that time! Thinking back, you might say that I'm quite patient with them huh? But I'd also ate their Curry puffs while waiting for my much awaited meal and the kuih was very yummy and just nice in terms of flavourings. They also had other assorted Buginese based meals, including the popular Buras (which usually only became available during the festive seasons). Since I have some free time due to the Hari Raya Aidiladha holidays, I think I'll do some catching up with my blogging and do double back-to-back reviews. Mind you, my review 'waiting list' has grown 'healthily' lately due to my 'busy-ness'. So this time around I present to you a little known eatery in Tawau called Upgrade Hamburgers and Coffee. And I say little known here because it's tuck away in a somewhat secluded side of the Fajar Complex. Actually its right at the back side of the commercial area, right next to the Nationwide Express courier office and overlooking a nearby housing area. The place was really nice and comfortable. But when I took one look at their menu, one thing popped onto my mind. OMG.. We had our own version of Subway! And I didn't even know that such thing was possible in Tawau (har har har..). So if you're interested in ordering their burgers, than the concept is similar to those of Subway - you picked your type of burger from the menu, you choose your topping & sauces and you also get to choose your side orders. Well, maybe not exactly like Subway but quite closely resembles them. So I've ordered their Roast Chicken Burger (which was really awesome in taste, love the patty as well) while my partner opted for something entirely different, their Nasi Kuning Kukus (yes, they also have a few rice based set should you choose not to have their burgers). Oh and because they're ran out of 'nasi kuning' my partner's order comes with regular rice, together with a beef patty and some 'sambal' (he's giving it a thumbs up). Also need I remind you that the food here are on the expensive side but don't be scared by them as the food quality were pretty top notch. If you're a Tawaurian (is that right?) then you'll know that Eastern Plaza is the place to be seen especially for the younger generation (this makes me feel old for some reason - sigh). Teenagers are usually seen crowding the place particularly on Saturdays and early Sundays and for most of them, money might be an issue. So what better way to hangout with friends while having some low-budget meals right? Then let me introduce to you the One Bucks Cafe (and no, unfortunately none of their food or drinks costs you RM1 only - sorry!). 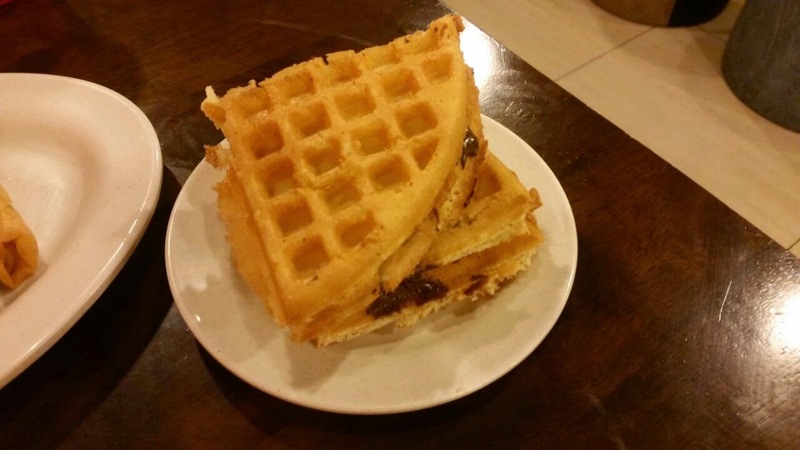 This 'light-snack only' cafe actually caters to the young and old. Formerly located on the ground floor of the shopping mall, they'd moved to the lower ground sometime last year. Their menus were pretty simple, which consist of your usual fried fritters, waffles and some ice-blended based drinks. 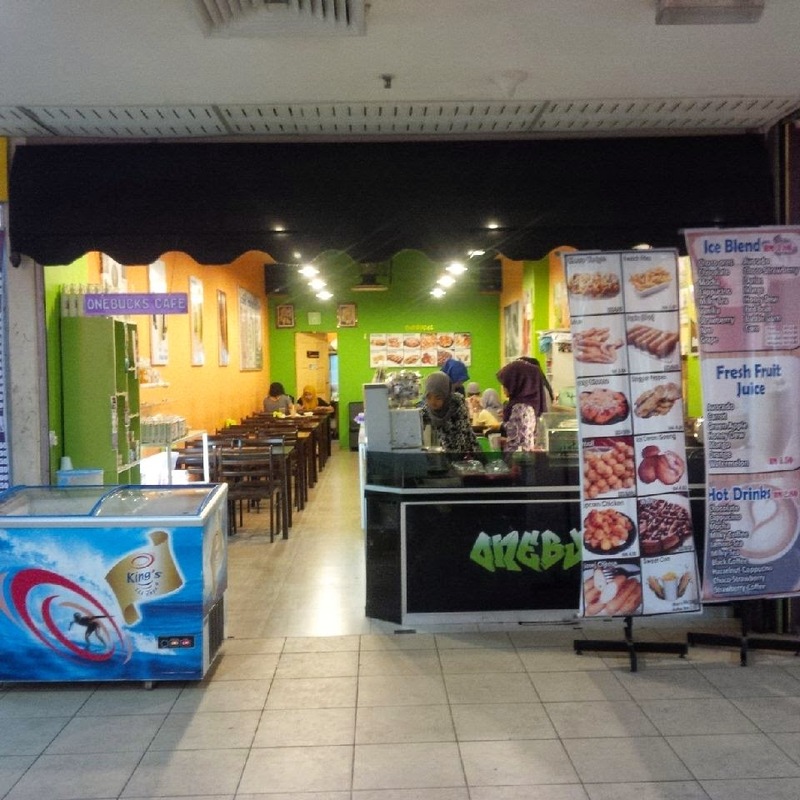 Granted, the place is a bit expensive as oppose to other stall-like eateries. Although a bit limited in size, the atmosphere inside the cafe was pretty relaxed (even though that long couch at the far side of the cafe really bugs me for some reason, and not in a good way). Me and my partner tried on several of their food (what can I say, we were really hungry) such as Keropok Lekor (awesome sauce by the way), Popcorn Chicken (tasty and spicy), Waffles (good but the filling was not that much), Fried Popiah (yummy filling - my fave so far) and Sanggar Peppek (fried bananas that had been 'smashed' to its flat perfection - unfortunately the taste is a bit debatable between me and my partner). I also recommend their juices (we tasted their Watermelon & Orange juices) as the tastes were just lovely.